Recreate the glamorous look of Cleopatra with this superb Egyptian Snake Bracelet costume accessory. 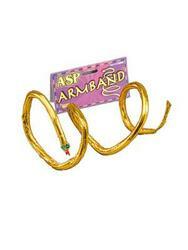 Included is a luxurious looking gold coloured bracelet styled to look like a snake which runs elegantly up the arm. Great for adding to any of our Cleopatra costumes and wearing to an Egyptian fancy dress party.